I recently took some photo's for my magazine. I only took a couple for the cover but I still need to take some photos for the contents page and the double page spread. I am going to get a couple of friends to help me out by taking the photo's an featuring in them. I took some last night for the cover then narrowed them down to the one that I will eventually use on the actual cover, and in today's lesson I put the image on my cover and started messing around with the titles to see what color looks best. It was quite hard to find a good color for the masthead because it kept blending in with the background and every-time I found a bright enough color it looked un-professional. Also the quality of the photo was not great so I may consider re-taking it for it was taken on my phone. Here is the photo I currently have on my cover, I may change it in the future with a better quality one. The theme of my magazine is hard rock so I tried to keep with the theme as much as i could, boots, ripped jeans, leather jacket, shirt and a cigarette. Also it is important to take mis en scene into consideration, everything else in the photo except from the person featured in it. 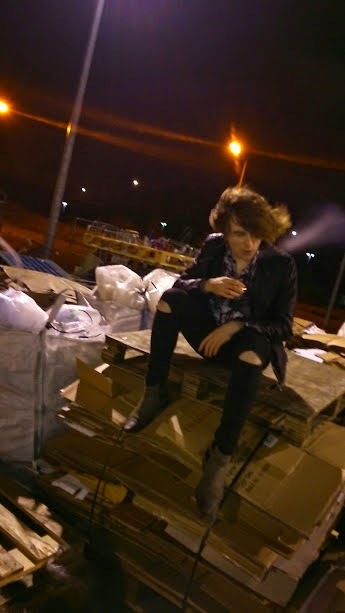 I tried to take it in a rather urban, gritty place and I think taking it on the boxes and pallets was the best place I could find, also the night-time effect really helps make it look dark and gritty. On our magazines, we have to have four of our own photos included. So I am planning on taking some more photos I'm also looking for other models to pose in photos.